Spring has truly arrived in Nagoya, the Sakura are in full bloom and in Japan that means it's time for Hanami (flower viewing). Everywhere you go you will see people sitting on blankets, tatami mats and tarps under the blooming Sakura trees, having pick nicks and sipping tea or sake. In the evenings the parks around Nagoya have lanterns scattered throughout the trees bathing the sea of flowers in a beautiful pink glow, it is like this city has turned into this magical fairytale land! I also finished the five pieces I was working on at the beginning of the year. Last week I took them out into the garden for their glamour shots. Some of these will be at the Women's Showcase at the Plastic Factory on Saturday April 14t so if you're in the Nagoya area please come out to see them in person! , Doors open at 7pm and the music starts at 8pm, tickets are ￥1500 at the door and include one drink! Womens Showcase at the Plastic Factory! On Saturday April 14th you will have a chance to show your support for women in the arts here in Nagoya! Come see some amazing performances and awesome artwork by female artists at the Plastic Factory, doors open at 7pm and the music starts at 8pm, tickets are ￥1500 at the door and include one drink! This is the event you've been waiting for! - the second ever Nagoya Women's Showcase! An entertaining evening of Music & Art from your favourite fully functioning female faction. ......May Chu Chu's Cabaret of Chaos! and our very own backing band, Don't Wrestle Ron! (Darian Gore, Yuki Angel, Coleen Wickdahl and Lesley Bartlett). .........Denise Buisman Pilger, the Artist Abroad. Hand layered photo based mixed media paintings. 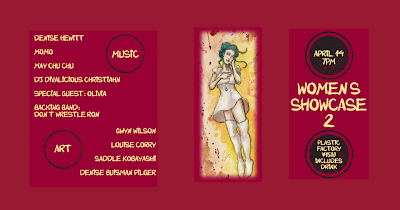 Come support some awesome female artists!